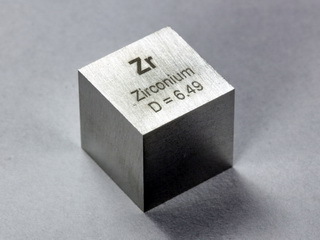 Zirconium was discovered in Berlin, Germany, in 1789 by M.H. Klaproth, but was not isolated until 1824 by J.J. Berzelius in Stockholm, Sweden. 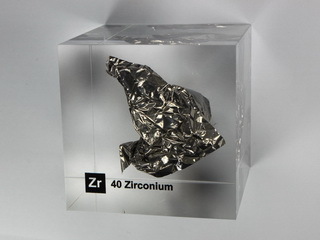 Zirconium is a hard, lustrous, silvery colored metal which is extracted from its ores (the oxide or zircon, ZrSiO4) by conversion to the tetrahalide followed by reduction with magnesium. 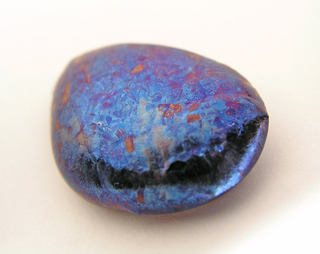 The metal is extremely corrosion resistant due to the formation of a stable oxide film and is unaffected by acids (with the exception of HF) and alkalis. As a result of its corrosion resistance, zirconium is widely used in the chemical industry where corrosive agents are used. Also, due to its excellent high temperature properties, coupled with its low neutron absorption, it is used in the construction of nuclear reactors. 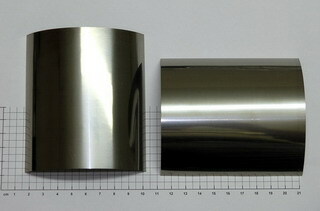 The pure metal is also used as a lining in jet engines. Zirconium is used as an alloying element, the resultant alloys having improved mechanical properties. Zirconium oxide, zirconia (ZrO2), is used as an opacifier in vitreous enamels as well as a pigment. However, the main applications of zirconia make use of its excellent strength and high temperature properties, and it is used to manufacture foundry crucibles, bricks, ceramics and abrasives. It has sufficient strength to enable it to be used to fabricate high precision knife blades.